Combined Heat And Power Backslides. But for How Long? Combined heat and power, or CHP, continues to be one of those great ideas that can’t seem to get traction. In fact, the technology has lost ground, according to a recent energy efficiency report. The American Council for an Energy-Efficient Economy found that CHP installations fell 1.5 percent at industrial facilities from 2010 to 2011 in the July 2, 2013 white paper, “Energy Efficiency: Is the United States Improving?” The other 14 energy efficiency markers that ACEEE evaluated – such as building codes, appliance standards and state efficiency programs – all showed at least some growth, most somewhere between 1% and 19%. CHP’s story, however, soon may take a turn. The resource is receiving a boost from two powerful sources: President Barack Obama and Superstorm Sandy. Obama in August issued an executive order that pushes for a 50 percent increase by 2020 in combined heat and power used by industry. As a result, the Environmental Protection Agency has kicked up its efforts to help states remove snags to CHP development. If the campaign succeeds, US CHP installations will grow from 82 GW to over 120 GW in seven years — an impressive leap. CHP backers say the US stands a better chance of reaching the target if Congress approves a bill introduced by US Senator Al Franken (D-MN). Called the Local Energy Supply and Resiliency Act, Senate Bill 1205 would provide CHP projects with loan guarantees and funding for technical assistance. Talk is underway about attaching Franken’s proposal to a larger energy efficiency bill, the Energy Savings and Industrial Competitiveness Act of 2013, a bipartisan effort that has gained significant business support. Mark Spurr, the legislative director for the International District Energy Association, provided some eye-opening data to show why we need to replace more conventional power plants with combined heat and power. In his testimony June 25 on behalf of Franken’s bill, he explained how much energy the US creates but never consumes because of our reliance on conventional generators. “What is striking is that of the total 97.3 quadrillion Btu (quads) of energy consumed, only 43 percent was converted to useful energy, and 57 percent was wasted,” he told the Senate Energy and Natural Resources Committee. Conventional power generation accounts for a big chunk of this waste: about 36 percent, according to Spurr. Power plants create a lot of heat when they generate electricity. Rather than reusing or recycling the heat, they let it dissipate into the air. CHP plants operate differently; they reuse the heat for hot water, steam, building heating and cooling, and industrial processes. Similar arguments in favor of combined heat and power have won strong converts in states like Connecticut, Massachusetts and New York, where the technology has been thriving thanks to friendly government policy. And now the Northeast states are looking even more closely at combined heat and power because of the massive power outages last year caused by Superstorm Sandy. Those left in the dark following the storm wondered why the lights were burning at South Oaks Hospital or on the campuses of New York University and Princeton University. These facilities have onsite combined heat and power systems, which can operate independently when the larger grid goes down. The Northeast wants to avoid a repeat of widespread electrical failures when the next big storm hits. Policymakers see CHP and related microgrids as partial safeguards. So yes, combined heat and power didn’t look terribly robust in the ACEEE ranking. But keep an eye on the industry. It’s time may be coming. It’s Been a Year Since Obama Set His Big Goal for Combined Heat and Power: How’s He Doing? The Real Power Behind Today’s Energy Efficiency Industry? What about Microgrids to Reduce Carbon Dioxide Emissions? 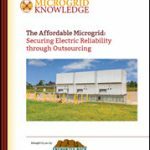 What is Government Doing to Spur Microgrid Growth? Thanks for the thoughtful article Elisa. My two cents is that: a) 1.5% drop is a statistical rounding error not to be construed as backsliding, and b) that CHP (cogeneration to people over 40!) has always been a needle-in-the-haystack solution. This is not a negative, it just means that CHP will ONLY make sense for a small percentage of clients in the best of circumstance. I have always told folks that the first three rules of CHP are: thermal, thermal, and thermal (i.e. CHP doesn’t make any sense if you don’t have displaceable thermal load). The key to success in the future (and the good news about the recent developments) is that we must eliminate regulatory barriers and artificial constraints. The underlying economics will take care of the rest! Thanks Pete. Good points. It will be interesting to watch how far the states go in removing the regulatory barriers…maybe the federal involvement will give a push? Great article – when you mentioned that ‘the technology lost ground’ – I was thinking that you were referring to R&D, etc. However, I’d agree with the previous comment, and add my two cents around ongoing macro trends like gas infrastructure investment alongside rapid advances in scalable , deployable tech that can bring down operating and investment costs.